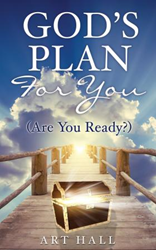 Within the pages of Art Hall’s book, God’s Plan for You: Are You Ready? ($11.49, paperback, 9781545639696; $5.99, e-book, 9781545639702), readers will find inspiring and encouraging personal stories that show how God can move in our lives. Through a powerful testimony and individual stories, the author explores the truth behind God’s plan for each of us. This book offers readers insight and inspiration for everyone. Hall believes God wants to be the guiding force in everything we do, and this book offers readers methods to help. Art Hall is a former Captain in the US Army who served in Vietnam. He attended Officer Candidate School and airborne training, jungle operations, and red eye missile training. As a civilian, he has owned and operated his own repair and maintenance business. Xulon Press, a division of Salem Media Group, is the world’s largest Christian self-publisher, with more than 12,000 titles published to date. God’s Plan for You: Are You Ready? is available online through xulonpress.com/bookstore, amazon.com, and barnesandnoble.com.